Lots has happened in the last few weeks, and things are moving along much faster than I believed possible. Fresh from the sale of my old Jensen Healey, 13301, and flush with cash, I'm now on a mission to begin on the new project. This means walking a careful tight rope between getting the parts and services I need and staying within my budget. My budget is a moving target at the moment, since the cost of many items is up in the air and certain funds ear-marked for the new car are already being diverted for non-car uses, grrr (who needs to fix the house?). But such is life and in the end, somehow, I'm hoping everything will get done before too much time elapses. I'm budgeting eight to twelve months for time and I'm thinking $6,000 to get this thing on the road (famous last words). Of course, before one can start, one will need a plan. I already have a spare engine that was going to be a 2.2 liter, so I'm moving ahead with that project, at least until I run out of money. I do have a totally stock motor in good shape that I'll save, but I figure a 170hp JH is a good thing when possible. The Jensen Healey will be mostly stock looking from the outside with with the exception of some added wood veneer on the dash and Dellorto carbs and a few other hidden performance goodies under the bonnet. 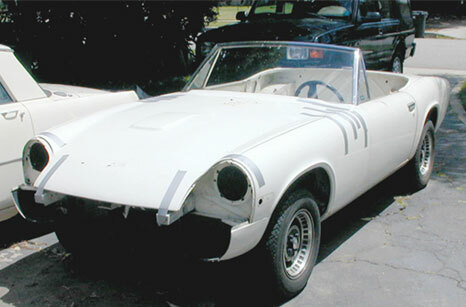 The body, in storage now, is getting closer to moving to the paint shop. I've found a place just around the corner from West Coast Cylinder Head in Reseda, CA and although a considerable 70 miles from home it's only 8 miles from where it's being stored at present in my friend Duane's driveway in Los Angeles (you're a pal Duane!) whom I talked into giving me this car. This month's journey begins at the California Department of Motor Vehicles, where I get hit up for $107 (+ $45 for personalized license plates, which I opted for, I figured the club needs some free advertising) to bring everything current and get a legal, road worthy registration, even though it's a project in boxes at the moment. Is this a great country or what? Parts are also being purchased. So far I've bought a set of new (tri-flow) 45mm Dellorto carburators with linkage. I've unearthed a Euro intake manifold to go with that. A brand new, Jensen Healey ignition switch was found on Ebay, a new set of wheel cylinders, and a shiny new walnut shift knob (whew, a new shift knob, now I can sleep peacefully at night). I already have a set of 2.2 main bearings that my friend Duane found at a swap meet for $5, the 2.2 liter crank shaft purchased 3 years ago and a master cylinder. High lift 104 cams were given to me by a nice person getting out of Jensen collecting.